* This chic vintage bridal cap or cocktail hat is an exclusive wholesale design from the new Mariell couture collection. * Handmade in the USA, our bridal cap is covered in luxurious White silk charmeuse adorned with intricate glistening lace. * Silk dupioni covers the underside of this sinamay based hat. * The front of our wedding cap features a 2 1/4" h wide-net lace visor veil scattered with Austrian Crystals. * Our stunning wedding cocktail hat rests on a slender 1/8" w satin headband. 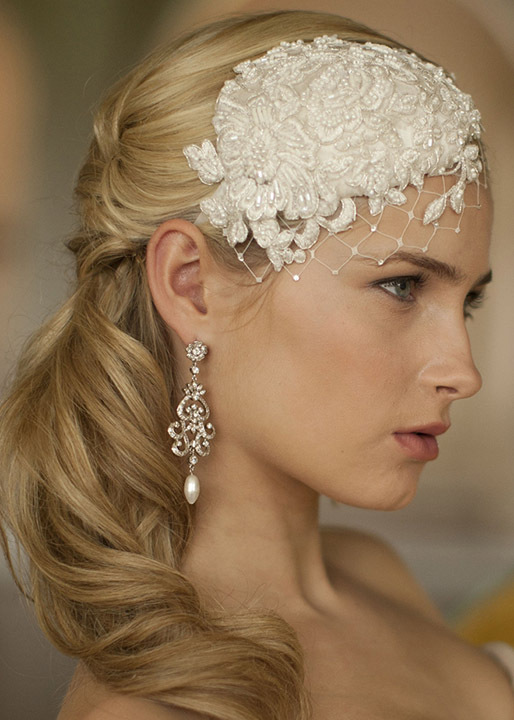 * This beautiful wholesale wedding hat is available in Light Ivory or White.